Grandparents and grandchildren – they go together like peanut butter and jelly or ice cream and chocolate sauce. 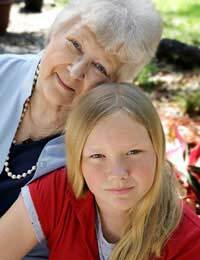 There is something unique and special about the grandparent/grandchild relationship that provides great benefit to everyone concerned. It’s easy to see this special bond just by watching the body language they display with each other. The grandparent/grandchild relationship is one of connecting and reconnecting. Grandchildren connect with a different generation, a different set of adult role models who are not burdened with the daily challenges of supporting and raising a family. Grandparents, on the other hand, are re-connecting with the pleasures that come with being part of a child’s life. They suddenly remember what it was like to play jacks or go down a slide, and they are anxious to do those things with their grandchildren. A grandchild’s body language is usually that of excitement, happiness, and unconditional love. They laugh, they smile, and they are expressive with their verbal and non-verbal communication. A child who has been lost in the daily routine of normal life will get a burst of energy at the prospect of spending time with a grandparent. A grandparent’s body language is usually that of softness, contentment, and often even indulgence. They get down on the floor and play, hold hands as they walk through the park, and eat ice cream cones for lunch, all as part of being with their grandchildren. Grandparents also exhibit a lot of teaching body language, demonstrating and explaining things as they go. A grandchild’s seemingly endless questions are not ignored or pushed aside, but rather heard and answered. Where do Parents Fit into All of This? Where the child’s parents fit into all of this can vary greatly. Most parents welcome the chance to have some ‘adult time’ while their child is with grandparents. Some parents almost don’t recognise their own parents’ behaviour as grandparents, because it is so different from when they were growing up. If family relationships are tense or unpleasant, this can show up in many different ways. Grandparents and grandchildren may not get to see each other as often, so therefore when they are together their body language is that much more noticeable. Or, the parents may avoid interacting one-on-one with the grandparents, instead focusing conversation and activities on the grandchildren. What We Learn From Grandparent/Grandchild Body Language? One of the most powerful things we can learn from observing grandparent/grandchild body language is the power and influence that comes from the two generations interacting directly with each other. Grandparents demonstrate patience through their calm voices, gentle directions, and hands-on activities with their grandchildren. Parents who are observant and willing to learn from these interactions often discover new and more productive ways to direct and guide their children. Grandchildren, for their part, learn a great deal from these interactions as well. They learn to be patient and respectful of their elders, and they learn how to do things their parents might not have the time or money to teach them. Just watching a grandparent walk into a restaurant, greet the server, use their utensils politely, and the like, can be powerful lessons on appropriate adult behaviour for later in their lives. What Happens When Grandparents Must Parent? In today’s world, all too often grandparents find themselves in a position where they responsible for some or even all of the parenting duties for their grandchildren. These are difficult situations because the grandparent doesn’t have the freedom to just be a grandparent, and the grandchild doesn’t have the freedom to just be a grandchild. The relationship becomes much more complicated, and so does the body language. Grandparents may not be able to physically keep up with every day activities, so they may look for opportunities for their grandchildren to be active while they are less active. You may see a grandparent teaching a grandchild to ride a bike, for instance, by keeping the child’s training wheels on longer because the grandparent can’t physically keep up running behind the bike. In the majority of cases, grandparents who must parent their grandchildren enjoy a very special bond that is readily apparent in their body language. The value of this bond is tremendous, to both the grandchild and grandparent alike.